Sehgal Foundation founder urges Indian Americans to give more. WASHINGTON, DC: Prominent Indian American philanthropist Dr. Suri Sehgal has urged members of the affluent Indian American community to donate at least a part of their income to philanthropy. Delivering the third American Bazaar Philanthropy Lecture, here at the Washington Plaza Hotel on October 1, the founder of the SM Sehgal Foundation pointed out that roughly 27 percent of the community has a median income of $140,000. If that segment of the population committed at least $1,500 a year — which is half of the money an average American household is giving annually — about $1.8 billion will be available for philanthropy, he said. 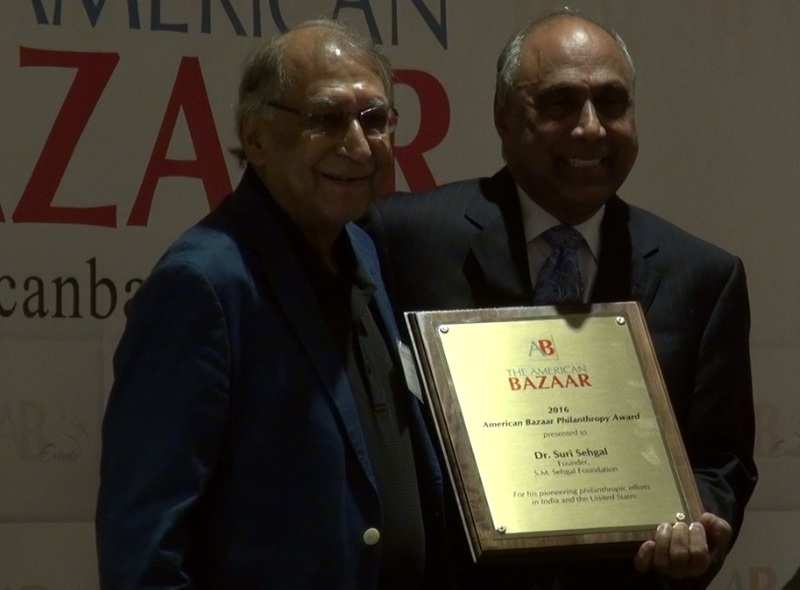 Earlier in the evening, Sehgal received the 2016 American Bazaar Philanthropy Award. Presenting the award, entrepreneur and philanthropist Frank Islam described Sehgal, who has committed most of his wealth to philanthropy in India, as an inspirational figure. “Those in this room that are not yet initiated into philanthropy don’t need to look further for inspiration,” said Islam, a recipient of the award in 2015. The SM Sehgal Foundation, headquartered in Gurugram, a Delhi suburb in the state of Haryana, is active in around 550 Indian villages. Dr. Suri Sehgal receiving the American Bazaar Philanthropy Award from Frank Islam in Washington, DC, on October 1, 2016. Sehgal, who came to the United States in 1959, described his journey from the pre-Partition Punjab to building a successful career in the United States and giving back to the country of his birth. The 82-year-old Sehgal, who holds a PhD in Plant Genetics from Harvard University and a diploma in business management from Harvard Business School, founded the SM Sehgal Foundation in the late 1990s. He and his wife, Edda, allocated most of the money they received after selling their India-based company Proagro group of companies, to philanthropy. Sehgal is the former president of the Des Moines, IA, -based Pioneer Overseas Corporation and vice president Pioneer Hi-Bred International. Speakers at the third annual Philanthropy Dialogue and Dinner included a number of well-known names in the Indian American philanthropy and development. Among them were Alex Counts, president of the American India Foundation (AIF); Dr. Sridhar Potarazu, Chairman and CEO of Enziime; Venky Raghavendra, senior director of AIF; Sohini Sarkar, a senior development professional; Moustafa Mourad, president of JKH Foundation; Angelina Klouthis, executive director of VFF USA; Shirley L. Posey, development director of DoPeace.org; Sanjeev Joshipura, Director of Special Projects, Indiaspora; Jay Sehgal, a trustee of the Sehgal Foundation; Rakesh Bhatia, president of Pratham DC; and Suresh Shenoy, vice president, global strategy at Wheels Global Foundation. The organizations represented included the American India Foundation, Pratham, Ekal Vidayala, Vicente Ferrer Foundation USA, and DoPeace.org, among others.